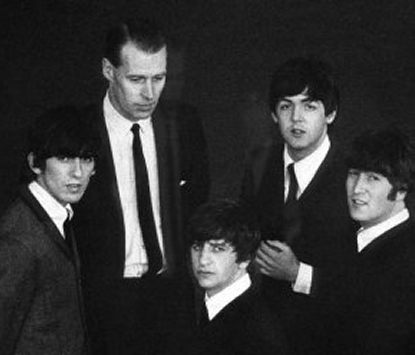 George Martin's hallmark orchestrations and innovative recording techniques helped shape the music of the late Twentieth Century and propelled many artists and bands onto the global stage. Classically-trained and recognised as one of music's most versatile and imaginative talents, George entered the music industry in 1950 after studying at the Guildhall School of Music and playing the oboe professionally in London. He began recording classical music specialising in the Baroque period. His later experience with jazz and pop led to his appointment as Head of the Parlophone label at EMI Group in 1955. It was there in 1962 that George signed The Beatles and so began an astonishing partnership with the band that revolutionised studio recording forever. As a producer he was responsible for bringing a host of artists into EMI's recording studios at Abbey Road. Prior to signing The Beatles, George had chart success, particularly in the humorous field, with brilliant performers such as Peter Sellers, Spike Milligan, Flanders and Swann and the 'Beyond the Fringe' team - Jonathan Miller, Peter Cook, Dudley Moore and Alan Bennett. He also worked with jazz artists Cleo Laine, John Dankworth, Humphrey Lyttelton and the legendary Stan Getz. His unprecedented run of hits in the '60's with The Beatles helped shape popular culture. Further chart success came with other artists of that era - Gerry & the Pacemakers, Billy J Kramer, The Dakotas, Shirley Bassey, Matt Monro, Millicent Martin and Cilla Black. In 1963 alone his productions spent a staggering 32 weeks at No.1 and he remains the world's most successful record producer to date with a career 30 number one's in the US and UK Singles Chart. In 1965 George formed a production company separate from EMI with three other producers - Associated Independent Recordings (AIR). Although autonomous, he continued to produce The Beatles for EMI - an innovative deal in its day and a precursor to the modern-day producer/record label relationship. Four years later he began the design and construction of the first Air Studios, a recording complex in the centre of London. Air has moved location since but to this day is one of the most successful studio operations in the world. In the mid '70's George started construction of Air Studios Montserrat, situated in the Caribbean, which attracted major artists from all over the world. Sadly, Hurricane Hugo devastated the island of Montserrat in 1989, and the studio had to close. In 1995 a volcano erupted on the island, causing more havoc and distress. George raised money to help the island regain its footing and built a new Arts and Culture centre for the locals. The current Air Studios was opened in 1993. Built within the walls of a stunning Victorian church in Hampstead, London, it caters for some of the world's biggest movie scores and recording artists. Air has become synonymous with high quality output and for being at the leading edge of the world's audio and visual technologies. During the '70's, George divided his time between working in the United States, Montserrat and England. He had started his own music publishing company, George Martin Music, and recorded a whole range of diverse artists including The Mahavishnu Orchestra with the London Symphony Orchestra; seven albums with America; two albums with Jeff Beck - 'Blow by Blow' and 'Wired'; solo albums with Kenny Rogers; Gary Brooker (from Procol Harum); Neil Sedaka; Jimmy Webb; UFO; Cheap Trick and Ultravox. Back in England George recorded two albums with Paul McCartney - 'Tug of War' and 'Pipes of Peace'. A composer in his own right, George composed and arranged the original music on a number of films, 'A Hard Day's Night' (for which he won an Academy Awards Nomination); 'The Family Way'; John Schlesinger's 'Honky Tonk Freeway'; 'Yellow Submarine'; 'Pulp' starring Michael Caine and Mickey Rooney; 'Optimist of Nine Elms' with Peter Sellers and the Bond movie 'Live and Let Die' (for which he won a Grammy). He was also Musical Director and Composer for 'Sgt. Pepper' starring the Bee Gees, 'Give My Regards to Broad Street' and the award winning cartoon 'Rupert and The Frog Song' for Paul McCartney. He also composed The David Frost Theme, 'By George' for television and BBC Radio One's signature tune 'Theme One'. George wrote three books. The first dealt with the early years of his life in the music business and was called 'All You Need is Ears'. The second, 'Making Music' looked at all the aspects of making music. The third, 'Summer of Love (With A Little Help From My Friends)' is all about the historic making of the 'Sgt. Pepper's Lonely Hearts Club Band' album. He was appointed C.B.E. (Commander of the British Empire) in 1988 for his services to the music industry and in the 1996 Queen's Birthday Honours, George was created a Knight Bachelor. Two years later he was named as the B.P.I's (British Phonographic Industry) 'Man of the Year' and in 1999 was inducted in to the American Rock & Roll Hall of Fame for his outstanding contribution to music. He received Honorary Doctorates from Oxford University, Salford University, Berklee College of Music in Boston, Lund University in Sweden and was also a Fellow of the Royal Academy. In 1989 George returned to spoken-word recording and produced a new version of Dylan Thomas' 'Under Milk Wood', starring Anthony Hopkins, Jonathan Pryce, Tom Jones and Catherine Zeta Jones. George wrote the music for the production with Elton John, Rod Edwards and Andy Leek and held a gala performance concert in aid of The Prince's Trust in the presence of H.R.H Prince Charles. During his career George produced and presented a number of successful TV documentaries about music. Most notably the BBC's 'Rhythm of Life' (1998) and the documentary on the making of The Beatles' 'Sgt. Pepper' album (1992) which won a Palme d'Or at The Cannes Film Festival. George was always been a keen follower of stage and theatre and in April 1993 Peter Townshend's 'Tommy' opened in New York, going on to win five Tony Awards. George produced the cast album, which won him his fifth Grammy in 1994 after a two decade gap. He went on to win further accolades for his live stage work on the Beatles LOVE show, which opened in Las Vegas in 2006. The Grammy-winning soundtrack, co-produced with his son Giles, is a unique blend of original masters manipulated to form a dynamic 90 minute soundscape including a new string arrangement of George Harrison's 'While My Guitar Gently Weeps'. The show and resulting album were great critical and commercial successes. The success of LOVE was the culmination of a couple of decades in the studio, sifting through the vast Beatles back-catalogue. George worked tirelessly throughout the 90's on the band's studio work, out-takes, rarities and unreleased material. Resulting projects such as the double album 'Beatles at the BBC' and the three part 'Beatles Anthology' became huge world-wide successes. In 1997 George put together and hosted the "Music for Montserrat' charity concert at the Royal Albert Hall that assembled one of the greatest artist line-ups since Live Aid - Paul McCartney, Eric Clapton, Sting, Elton John, Mark Knopfler, Midge Ure and Carl Perkins. The event was the first ever pay-per-view concert televised in the UK by Sky. He also produced Elton John's tribute to Diana, Princess of Wales which gave him his 30th number one hit single. In a finale to a brilliant and unparalleled recording career, George retired from studio recording in 1998 with the completion of two projects. The first project was his album 'In My Life' which featured mainly Beatles tracks performed by some of George's 'heroes and friends' - Robin Williams, Jeff Beck, Phil Collins, Celine Dion, Goldie Hawn, Jim Carrey and Sean Connery. Supported by a documentary about its making, the album achieved Gold status in Australia, Canada, New Zealand and the UK. The last project was for another old friend. Asked by Yoko Ono, George contributed to the John Lennon anthology 'Wonsaponatime' with a string arrangement of John's home-taped track 'Grow Old With Me'. In 2001 EMI released the retrospective 6 CD boxed set 'Produced By' which, for the first time ever, pulled together some of George's greatest recordings from his 50 years in the studio. With sleeve notes by Mark Lewisohn, this collection of tracks and notes represents the definitive overview of one of the finest music production careers ever. In late 2001 and early 2002 most of George's time was spent arranging the musical celebrations for the Queen's Golden Jubilee, which culminated in a hugely successful, globally telecast rock concert from the grounds of Buckingham Place on June 3rd. The DVD release of the event, 'Party at the Palace' raised millions for charity. George spent less time in the studio in his later years but still managed to work; writing music; working with charities; advising broadcasters and government on music content. During a career that spanned seven decades George was awarded two Ivor Novellos, six Grammys and in 2008 was the recipient of the Grammy Foundation's Leadership Award. 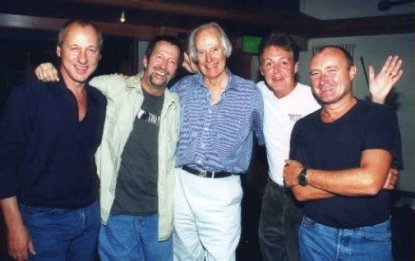 The critically acclaimed BBC Arena film documentary about his life, 'Produced by George Martin' was released in 2012.